NSG's new Micro Focus Cell is the panacea for all laboratories looking to make micro-spectroscopic analyses of DNA, RNA and amino acids. 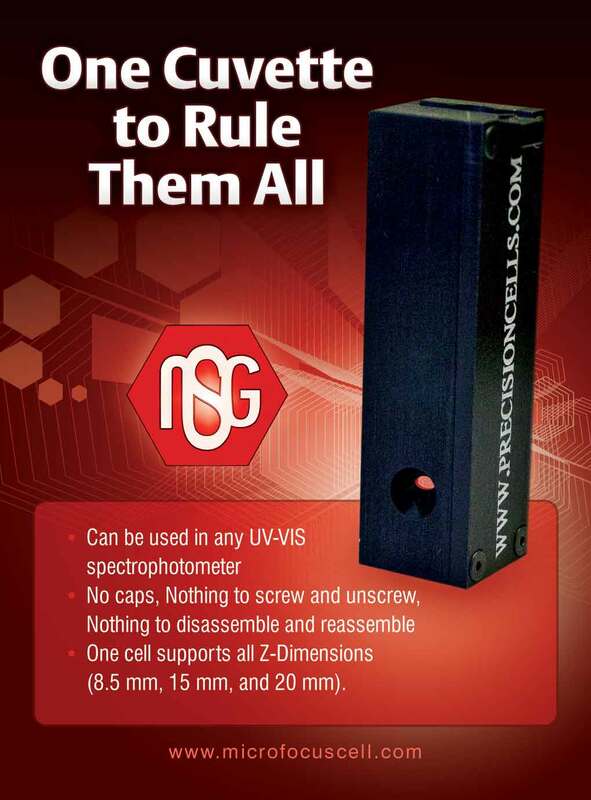 NSG understands the difficulties inherent in DNA measurement and, using the finest in optics technology, has produced a tool that simplifies this procedure. The Micro Focus Cell turns virtually any spectrophotometer into a nano-volume machine, sparing scientists from investing in expensive new devices. When looking to acquire the best results from working with DNA measurements, one must possess a cuvette that is capable of handling the job. Not just any cuvette can be used for DNA measurements since the samples are very expensive. The costs of samples forces users to look for the smallest volume cuvette, mostly ranging in the microliter size. This past month, NSG Precision Cells has made its contribution to the field of DNA research by releasing its groundbreaking new Micro Focus Cell that has been taking the biological field by storm. Users are commenting that this new DNA measurement cuvette is a huge step forward in DNA experiments. The NSG Micro Focus Cell allows users the ability of using a sample size of 1.9 micro liters- a volume, which requires only a mere drop of sample. The biggest benefit of this ultra micro volume is that no dilution of the sample is required. Many larger cuvettes demand that a user dilutes the sample which causes inaccurate DNA measurement results. The Micro Focus Cell turns virtually any spectrophotometer into a nano-volume machine, sparing scientists from investing in expensive new devices. Overly complex optics can cause alignment issues and loss of valuable time and data. The Micro Focus Cell utilizes a unique design, which does not use any mirrors, prisms, or fiber optics. NSG's patented design allows the light source to go directly through the sample, something never seen before with this type of cell. NSG guarantees the performance of the MFC for DNA measurements and the size and shape of the optical beam of a spectrophotometer has no effect on the results produced by the MFC. This is the only product in its class that can make this statement. When looking for the best accuracy and reproducibility in the DNA measurement field, the NSG Micro Focus Cell is the best way to go. Offering a tremendous list of benefits, such as perfect alignment, high reproducibility, high accuracy, the MFC is a must have for every laboratory.